Definition at line 159 of file llevent.h. Definition at line 61 of file llevent.cpp. Definition at line 67 of file llevent.cpp. References mDispatcher, LLPointer< Type >::notNull(), and NULL. const LLSD & userdata = ""
Definition at line 173 of file llevent.h. References mDispatcher, and LLPointer< Type >::notNull(). Referenced by LLVOAvatar::buildCharacter(), LLObjectBridge::buildContextMenu(), LLAgent::init(), LLUI::initClass(), LLNetMap::LLNetMap(), LLPanelGroups::LLPanelGroups(), LLVoiceClient::LLVoiceClient(), LLMenuGL::parseChildXML(), LLControlBase::registerListener(), saved_settings_to_globals(), and settings_setup_listeners(). 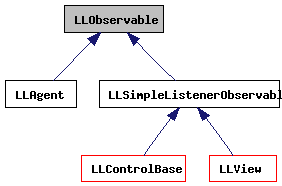 Definition at line 100 of file llevent.cpp. Referenced by LLMenuItemCallGL::buildDrawLabel(), LLMenuItemCallGL::doIt(), LLControlBase::firePropertyChanged(), LLMenuItemCallGL::handleAcceleratorKey(), LLButton::setToggleState(), and update_group_floaters(). Definition at line 94 of file llevent.cpp. Definition at line 177 of file llevent.h. Definition at line 77 of file llevent.cpp. Definition at line 185 of file llevent.h. 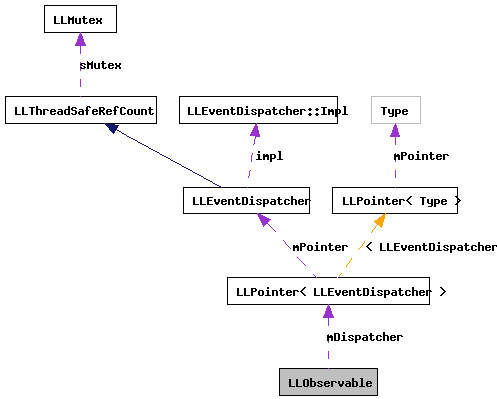 Referenced by addListener(), fireEvent(), getDispatcher(), LLMenuItemCallGL::getXML(), removeListener(), setDispatcher(), and ~LLObservable().